Designs by Lisa Somerville: Three Clover Thursday - Gobble...Gobble! Three Clover Thursday - Gobble...Gobble! Thanks so much for stopping by, I hope you have a Happy Turkey Day! Today is also Three Clover Thursday Challenge Day - Kerry issued the Theme Thanksgiving or Thank You Cards, how fitting, don't you think! Of course I just couldn't resist inking up the beautiful 3 Step Turkey Trot from Kitchen Sink Stamps one more time. Don't forget Kitchen Sink Stamps is having a Black Friday Sale, Friday November 27th ONLY - use code LISA20KSS to save 20% on everything in the store, along with FREE shipping on all orders in the US over $50. The image is stamped as follows on Neenah Ivory: #2 Stampin' Up! Pumpkin Pie, #1 Stampin' Up! So Saffron, #3 Stampin' Up! Close to Cocoa, then cut with Spellbinders Circle Dies, layerd on a Chocolate Circle, then Copper Circle, then on a Pumpkin panel that was cut with Labels Three. This was layered on a Chocolate Panel, the bottom was punched with the Arch Lattice Punch, layered on a Copper Panel, then to the Cosmo Cricket Paper Panel. To go along with the stitching already on the paper, I added some Drywall Stitching to all sides. Don't forget to click on the Three Clovers Logo on my sidebar to see what Kerry and the other challenge players created today! ..and gobble gobble back at ya'! 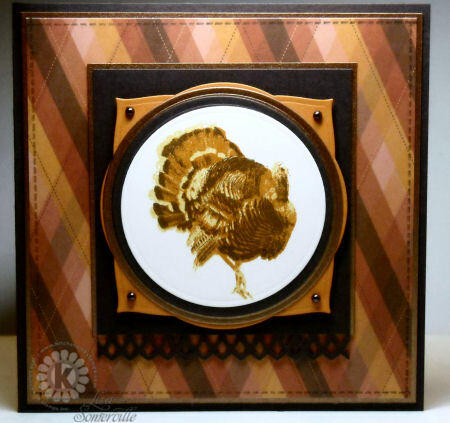 Beautiful card, the turkey, the layers and the colors. Enjoy your day.